Slathered with more futuristic styling than a DeLorean, the EXO all-electric watercraft from Exoconcept will have you throwing up wakes with more high-tech swagger than James Bond. Built with a 100 percent carbon fiber body (or optional plastic version for budget-buyers), the EXO watercraft comes packed with either a 3.5, 4.5 or 7Khw electric engine, which is powered by four racks of removable battery packs. Exoconcept also offers two additional racks of batteries for extra-long aqua-fun-time. (The company has not explicitly said how long a charge will last, or what amount of time it will take to refuel the juice.) Providing the get-up-and-go is a jet-propulsion system that runs in complete silence. The speed of the EXO also hasn’t been published, but Exoconcept says the craft has “breathtaking acceleration,” which is good enough for us — especially considering the craft outputs zero emissions, which is far more than can be said for a regular jet ski. Adding to the uniqueness of the EXO is how you ride it. 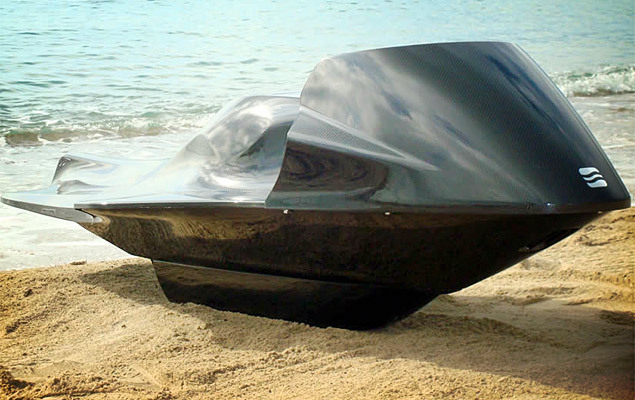 Unlike a regular jet ski, the EXO requires riders to lay flat on the craft, much like one would ride a boogie board. The riding position, while certainly attention-grabbing, looks a little awkward to us — unless, of course, you’re blasting down a Venetian canal after assassinating a super-villain. But in that case, you could be driving a pedal boat and still look impressive. The EXO comes in either raw carbon fiber, or Exoconcept will paint the craft a variety of colors, based upon buyer preference. There’s no price listed for the craft, but the company says it will create custom packages for customers, so we can’t imagine the EXO comes cheap. Fortunately, daydreams of blasting around on a jet ski from the future are free.